I'm a little "picky" when it comes to an Old Fashioned Recipe. I rarely order an Old Fashioned unless I know in advance how the bartender will make the cocktail. When I hire a bartender at the restaurant I usually re-train him or her on making a number of classic cocktails. The Old Fashioned restaurant drink recipe is one of those drinks. How certain classic drink recipes get changed over time is somewhat of a mystery to me. I insist bartenders make them according to the original recipes whenever possible. 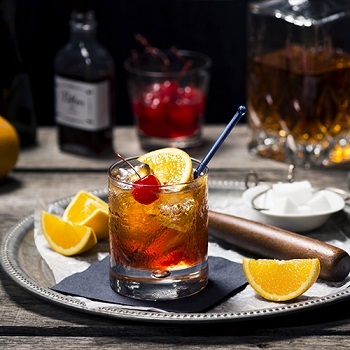 The Old Fashioned really is an old drink, dating back to the 1890's. From my research I believe the beverage was invented by a bartender at the once famous Pendennis Club in Louisville, Kentucky. As far as I can determine, the original recipe was first published in a book entitled "Modern American Drinks" (1895). It was written by a man named George J. Kappeler. The old fashioned has experienced a recent resurgence, maybe because Don Draper jumped behind the bar to mix a couple in season three of Mad Men. Preparation time: 2 minutes. Serves 1. 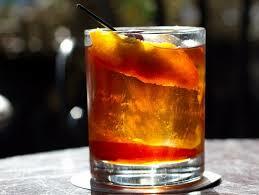 That is the correct way to make an Old Fashioned. Notice that there is no club soda and no Maraschino cherry. It doesn't hurt anything if you want to garnish your drink with a cherry but you really shouldn't plop it into the bottom of the glass. A better garnish would be a half slice of orange or a curled lemon peel. 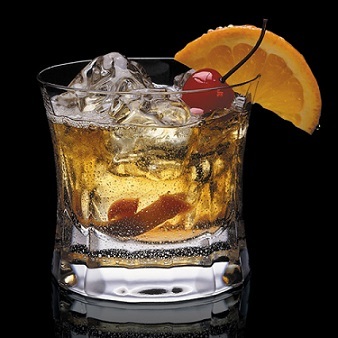 The way an Old Fashioned is "built" will determine the quality of the drink. Now compare the original Old Fashioned restaurant recipe to the way most bars serve it today. The two main differences are the muddling and the use of club soda. These are enough to result in a really different drink. Enjoy your Old Fashioned recipe and the company of those you share it with!